Spoiler: The raccoon is Keyser Soze. GUARDIANS OF THE GALAXY. I've admired writer/director James Gunn for years, even if I'm not an outright fan of everything he's done. He cut his teeth at Troma Studios, way back when, and accidentally catching its Toxic Avenger movies on TV as a child both shaped and scarred me in ways I'll likely never understand. So I feel like Gunn and I share some minor part of the cinematic journey. More than that, though, I applaud his ability to sustain a career inside the Hollywood machine — with screenplay credits for Dawn of the Dead (2004) and both Scooby Doo movies (2002, 2005) — while maintaining the passion and drive to make his own, edgier projects. Slither (2006) and Super (2010) are indisputably the work of a person with a singular vision: a dark, skewed, challenging perspective on popular entertainment. They are also, both because and in spite of their tendency to induce discomfort, hugely entertaining. To me, Gunn has the ideal resumé to helm a summer blockbuster. I'm just shocked that anybody in Hollywood agrees with me and that the weekend box office has proven us right. Unlike the rest of the recent, gargantuan Marvel franchise (excepting parts of The Avengers), Guardians is pleasing and successful because it refuses to succumb to seriousness. To be sure, it has within it moments of genuine gravity; it opens with a boy losing his mother to cancer, of all things. On balance, though, the movie is weighted more toward humor and excitement. It's funny and colorful and atmospheric; kind of like reading a comic book. Immediately after his mother's death in 1988, the young boy of the opening is presumably abducted by aliens. We next encounter him 26 years later on an abandoned planet in some far-flung corner of the universe. Peter Quill/Starlord (Chris Pratt) has grown into a wise-cracking intergalactic thief, and an unlikely part of a ragged, prickly crew called Ravagers. After he finds and makes off with his prize, an ornate orb of unknown import, things get hairy. Turns out he double-crossed his Ravager boss Yondo (Michael Rooker), who put a bounty on his head. By the time he makes another planet to sell the orb, cyborg raccoon bounty hunter Rocket (Bradley Cooper) and his tree-man sidekick Groot (Vin Diesel) are all over him. Likewise Gamora (Zoe Saldana), a green assassin dispatched by the genocidal maniac into whose hands we must hope the orb does not fall. 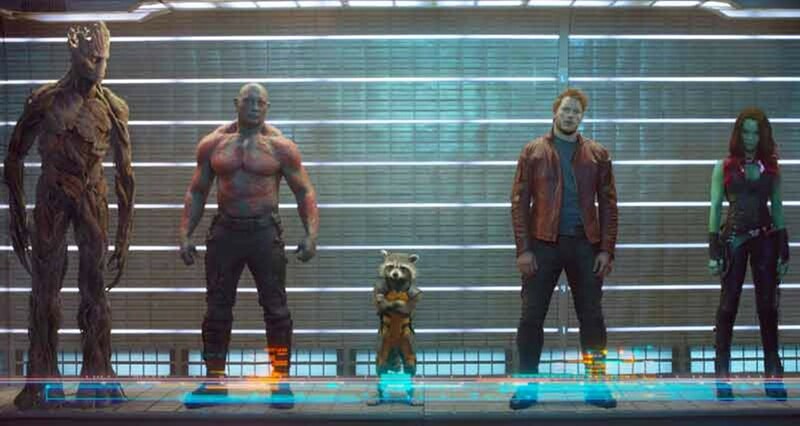 A protracted showdown in a shopping center lands Quill, Rocket, Groot and Gamora in prison. Circumstances bring them together with revenge obsessed Drax the Destroyer (Dave Bautista), and the team ends up fighting shoulder to shoulder to, well, guard the galaxy. It's a little complicated, with a lot of characters and plot thrown at us all at once, and that's my only complaint. Gunn paces the exposition expertly so we're not completely overwhelmed, but he may have incorporated too much story for the movie's own good. But he does it with such immersive art direction and clever dialogue, that I have to forgive that minor trespass. Even if my attention slipped during the more expansive battle sequences, I was still involved in the narrative and compelled by the team dynamic of the protagonists. Guardians of the Galaxy is exciting and good-looking, but most importantly it is fun and funny, a rare combination among recent summer fare. PG13. 121m. GET ON UP. Since James Brown is arguably the most vital, important figure in 20th century American music, it shouldn't come as a surprise that we'd get a biopic sooner or later. This one is intermittently compelling, well-enough acted and competently made, but it only made me wish I was watching a good documentary, or even a concert movie, instead. I appreciate that Taylor, with screenwriters Jez and John-Henry Butterworth and Steven Baigelman, chose to include the bizarre 1988 incident, wherein a grief-stricken, drug-addled Brown accosted a woman for using his toilet. It's an indicator that the creative team intended this as a sort of warts-and-all portrait of the man. But they settle for a happy ending, leaving behind much of the complexity and moral ambiguity suggested throughout the movie. There are some hard themes and ideas inside Get On Up, but they never get full treatment. The end result feels, in spite of the amazing soundtrack (thanks to "producer" Mick Jagger, who owns the Brown catalog, apparently), stagy and inconsequential. PG13. 138m. TEENAGE MUTANT NINJA TURTLES. Back into the sewers for more '80s kids' money with a slightly more grotesque set of turtles than the cartoon. With Megan Fox and Will Arnett. PG13. 101m. INTO THE STORM. A town is battered by a series of tornadoes in one day. With Richard Armitage and a profound lack of sharks. PG13. 89m. STEP UP ALL IN. Like Step Up, but all in. Dancers from the previous films (um, not Channing Tatum) throw down in Vegas. PG13. 112m. THE HUNDRED-FOOT JOURNEY. Helen Mirren plays a schmancy restaurant owner who wars with the new Indian place across the street in this comic gastro-romance. PG. 122m. HERCULES. Even Dwayne Johnson's lion-topped mug can't make this predictable ruin come alive. With John Hurt and Ian McShane. PG13. 99m. LUCY. Director Luc Besson muddles an interesting idea with half-baked plotting, wasting Scarlett Johansson as a woman dosed with a drug that allows her to access the other 90 percent of her brain. R. 90m.